The BlueSMiRF is a Bluetooth wireless serial cable replacement from SparkFun Electronics. These modems work as a serial (RX/TX) pipe and can be used to wirelessly send data from an Arduino to your computer/mobile phone/other Arduino. These units work best when the distance between the Arduino and the computer is small (under 10 meters). You might see data loss even after 5 meter distance. Use the Xbee modules for more reliable wireless connection with longer range. All of the BlueSMiRF modules in the lab are set to a baud rate of 115 200. Very robust link both in integrity and transmission distance (100m) – no more buffer overruns! 1. First you need to connect the BlueSMiRF properly. Note that you need to connect the RX pin of the BlueSMiRF to the TX pin of the Arduino and vice versa. The BlueSMiRF should blink a red LED. 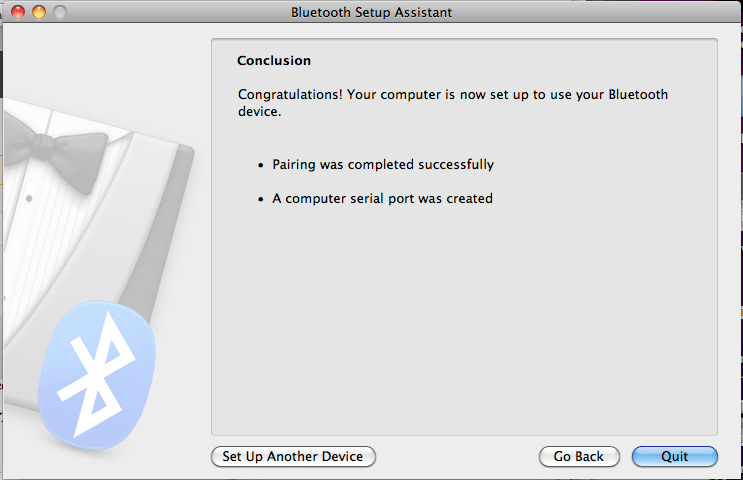 This tells you that it is on, but the serial port is not connected to anything. 2. Then you need to pair the module with your computer. 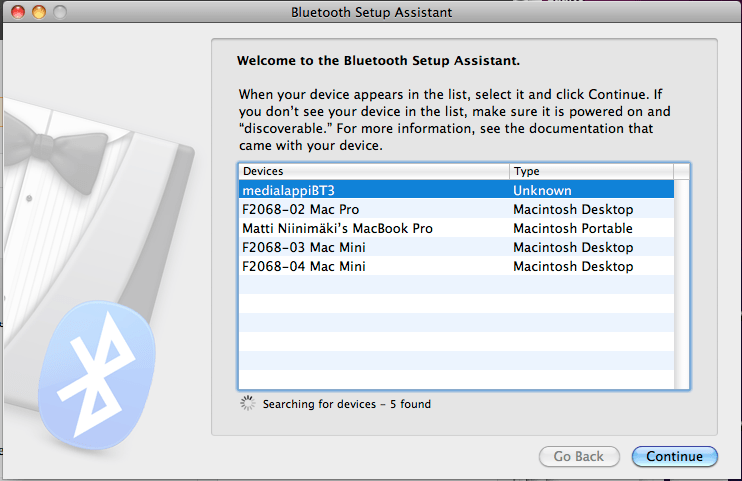 This is how you do it on Mac OSX. 2.2. 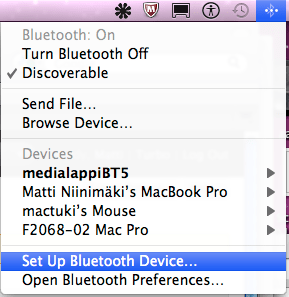 Click on the bluetooth icon on your menu bar and click on “Set Up Bluetooth Device”. 2.4. 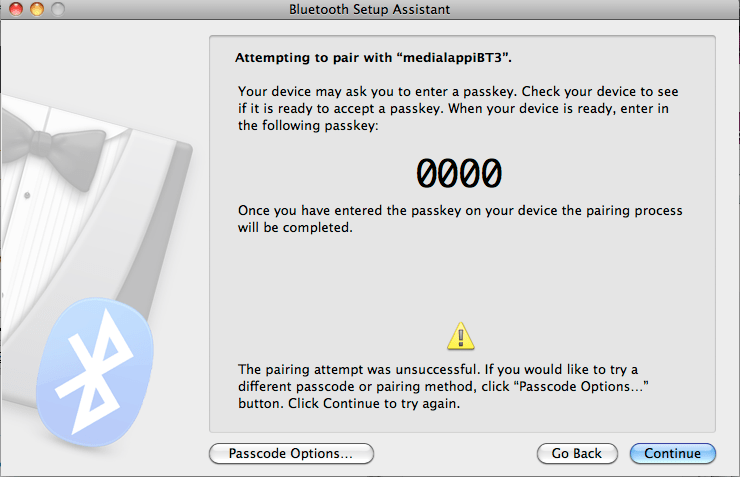 Your computer will try to automatically pair with the module with a passkey 0000. This will not work. 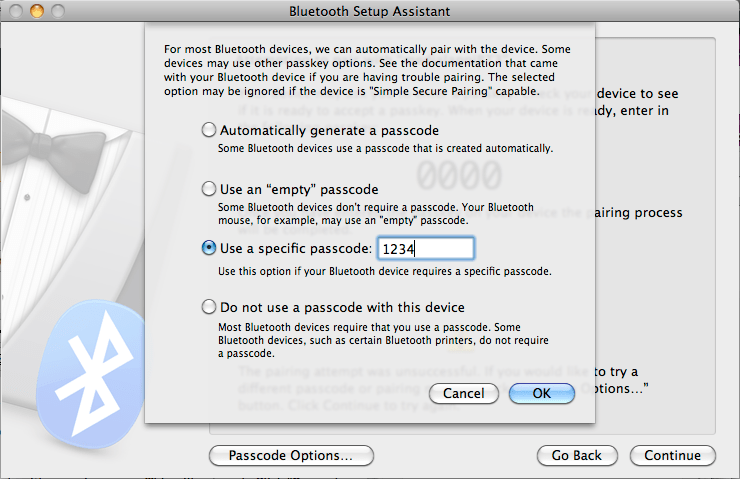 Click “Passcode Options”, select “Use a specific passcode:” and type in 1234. Click OK and Continue. 2.5. If everything goes correctly, you should see a screen like the one below. If not, read the instructions once more and try again. 3. Now you should be all set to pass serial data between your computer and Arduino via bluetooth. However, you can’t upload any code to your Arduino board via the bluetooth link. You have to do it normally using the USB cable. 4. Connect your Arduino to the computer via USB and open the Arduino application. 7. Select you board and serial port like you normally do from the Tools menu. 8. IMPORTANT: Unplug the RX Wire on your Arduino before uploading. You will get an upload error if you don’t do this. 9. Upload the code by clicking the Upload-button. 10. Open the Arduino Serial Monitor and set the baud rate to 115 200. 11. The green LED on the BlueSMiRF should turn on and you should see an ASCII character map being printed on the Serial Monitor. Press the reset button on the Arduino to print it again. 12. Now you are all set to use the BlueSMiRF in your own projects. Do something creative with it.